ELMIRA, N.Y. -- An 8-month-old baby found alive in a plastic bag outside a home had been abandoned there three days earlier by her 17-year-old mother, who has been charged with attempted murder, authorities said. Elmira police said neighbors checking out a noise early Tuesday afternoon found a baby whose feet were sticking out of the bag. They called 911 and tended to the child until police and emergency crews arrived. The baby was in stable condition at a hospital, officials said. 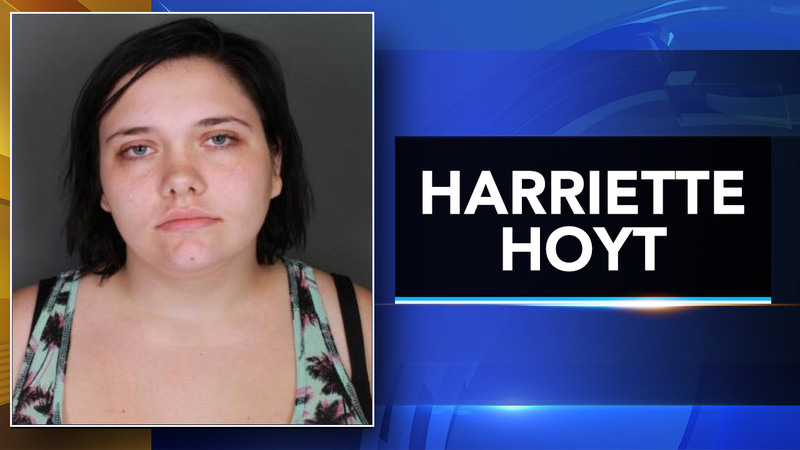 Later Tuesday, police charged Harriette Hoyt with attempted murder. Officials said she's from Sayre, Pennsylvania, on the New York border about 20 miles southeast of Elmira. According to court records, Hoyt left the baby near bushes in a backyard last weekend, the Star-Gazette of Elmira reported. A pair of sisters named Kayla and Karen Seals made the initial discovery after hearing what they described as odd noises and at first thinking it was an animal in distress. "My sister came out off the porch and went to the side to the backyard of my neighbor's house with a stick, thinking it was a dog," Karen Seals told Elmira television station WENY. As Kayla Seals approached, she realized the object on the ground was a baby in the plastic bag. "Her legs were just dangling in the bag. Her head was in the bag. Her whole head was covered all the way down," Kayla Seals said. Police praised the sisters for immediately getting the child inside and rendering aid. "They are truly heroes in this incident," Elmira police Sgt. William Solt said. Hoyt was being held Wednesday in the Chemung County Jail. Her public defender wasn't available for comment. Under New York state's Abandoned Infant Protection Act, a parent can abandon a newborn who is up to 30 days old anonymously and without fear of being prosecuted if the baby is left at a safe place, such as a hospital or fire station. The law was enacted in 2000 and amended 10 years later to increase the length of time when a newborn could be abandoned from five days after birth to 30 days.